Hey there, friends! 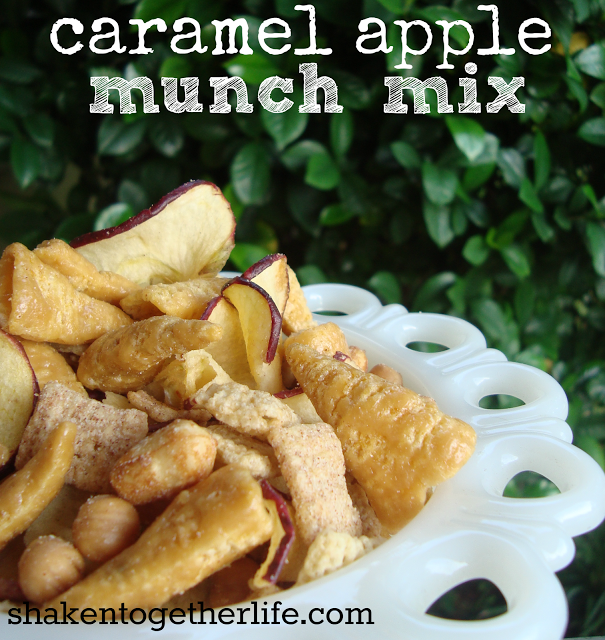 Keri here from Shaken Together with a fun no-bake treat that your family will love! 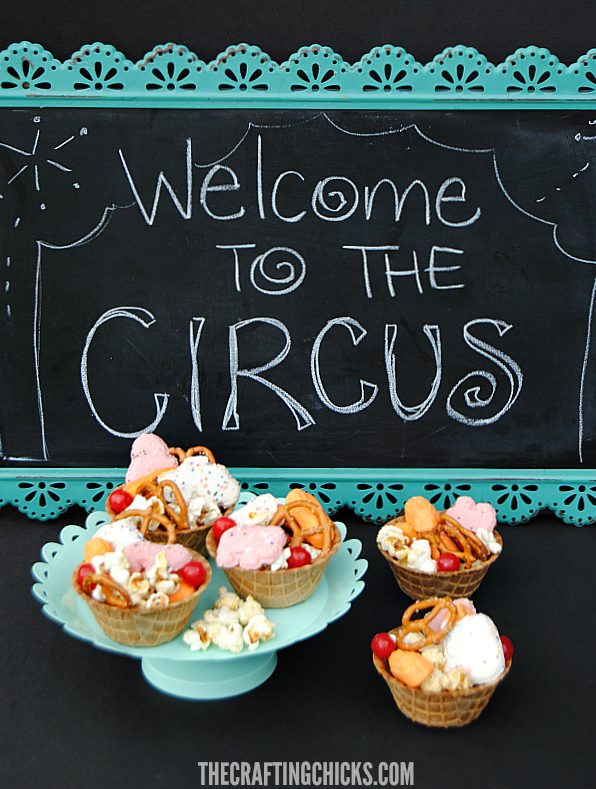 I am channeling striped tents, lion tamers, tight rope walkers and clowns for this big top themed Circus Snack Mix! 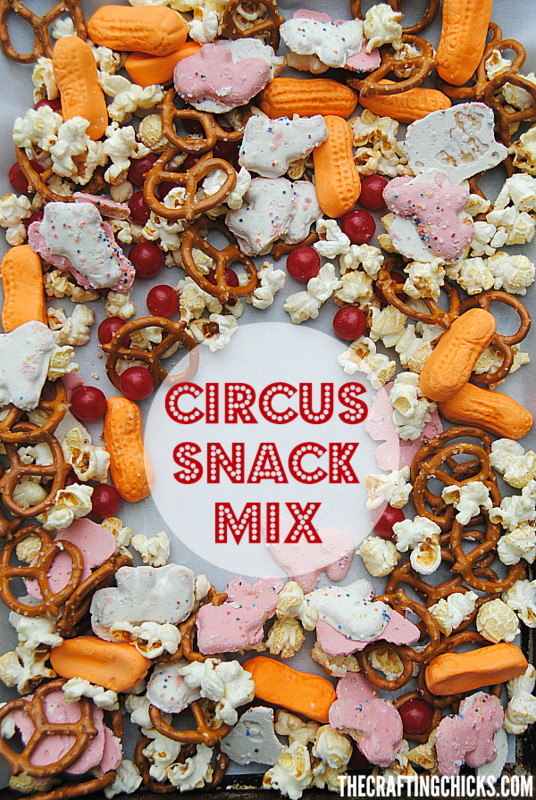 With a mix of circus themed treats, this snack mix would be perfect to take along on a trip to the circus, for a Dumbo movie day or a big top themed play date! Come on in … welcome to the circus!! 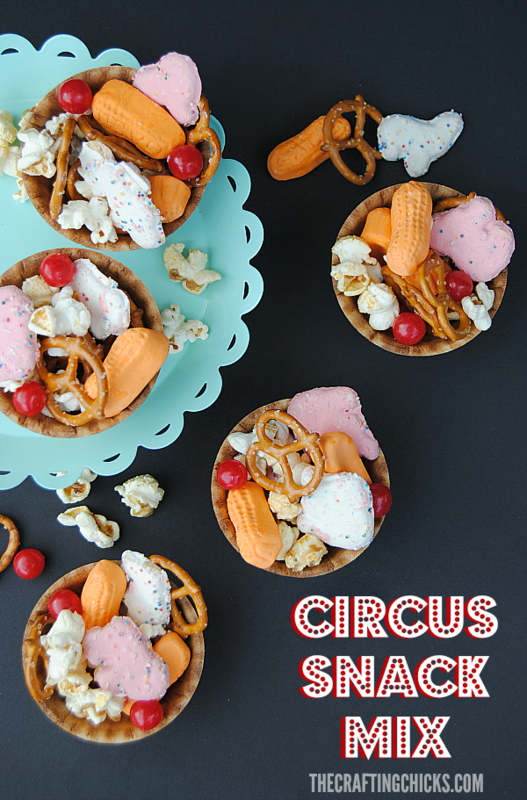 Circus Snack Mix is almost too much fun in one no-bake snack! The kids can help with shopping and picking out the ingredients at the store and then help at home with the measuring, scooping, stirring and serving. 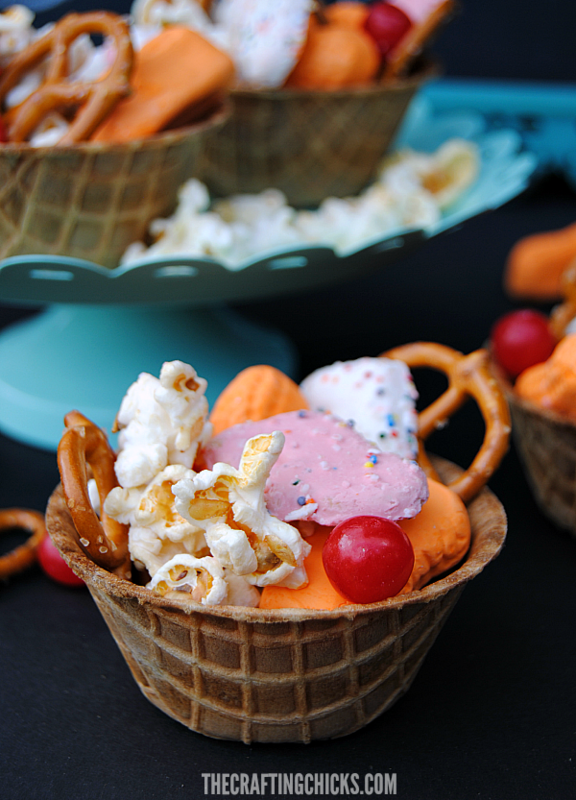 When you are ready to serve, mix together circus peanuts, pretzels, kettle corn, frosted circus animal crackers and sour cherry candies in a large bowl. There are no specific measurements - just put together to your family's tastes! Serve in polka dotted cups, snow cone paper cones or even mini waffle cone bowls! Store any leftovers in an air tight container and eat within a day or two. While small paper bowls or cups work just fine to serve this fun snack … serving Circus Snack Mix in mini waffles bowls ups the fun and cuteness factors x1000! Wonder why I picked each ingredient for the Circus Snack Mix? Circus Peanuts (or substitute honey or dry roasted peanuts) – elephants, the stars of the big ring, eat peanuts and so do all of their adoring fans! Frosted circus animal crackers – bears, horses, lions and tigers have long time been featured at the circus. 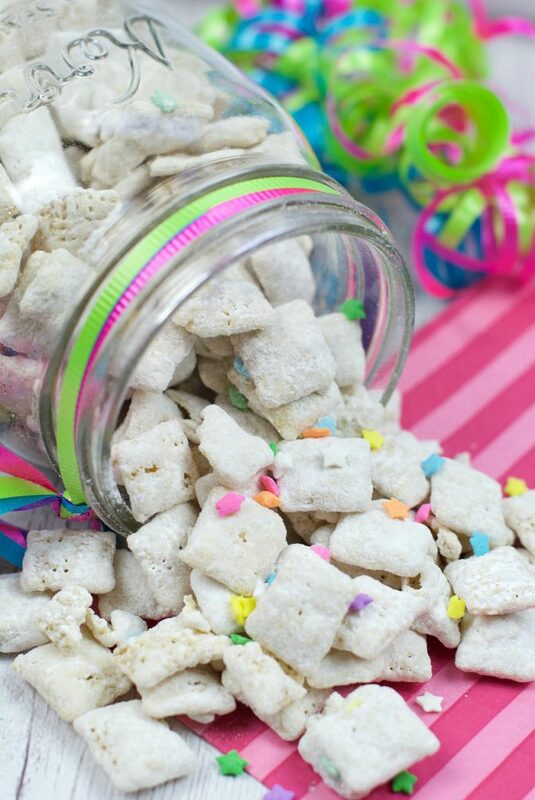 Feel free to substitute regular or chocolate animal crackers if you are not serving this snack mix immediately. 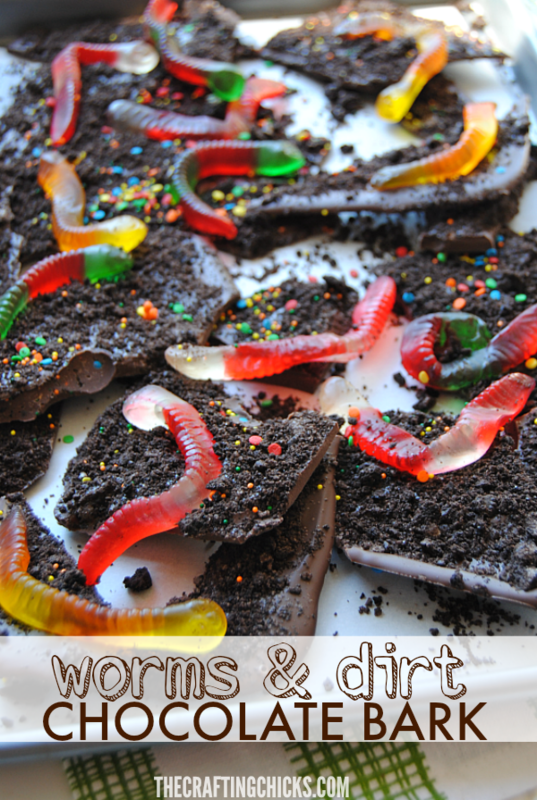 What a fun way to get the kids in the kitchen and serve up some serious fun! Keri is a wife, mom (to two baseball loving teenage boys), home cook, FL girl and the creative juice behind her blog, Shaken Together, where she shares recipes from breakfast to dessert and everything in between! 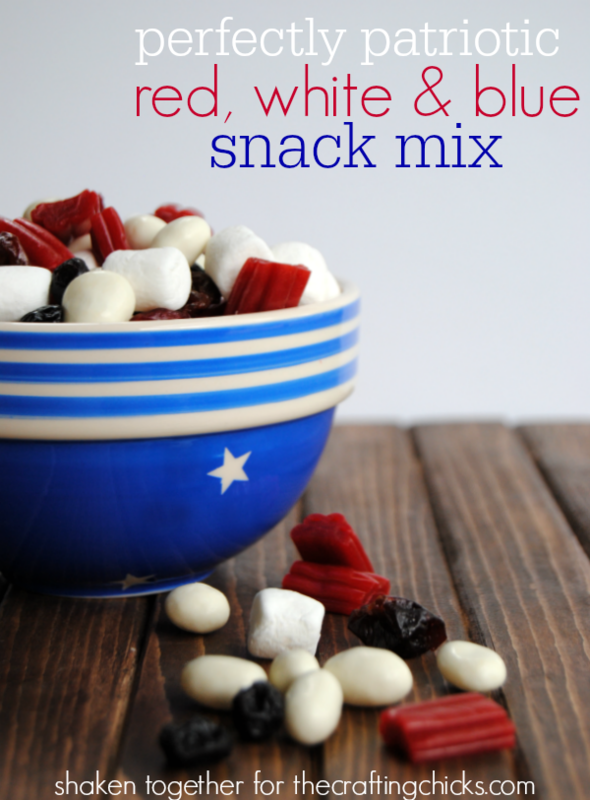 This circus snack mix is a great treat, even when not actually attending the circus! By combining favorite treats such as circus peanuts and animal crackers, it creates a snack that the whole family will love. I like to use a combination of chocolate and regular animal crackers to make the mix extra special.